Freshëns relies heavily on customer research to keep its product offerings relevant and “on trend” to its customers. The Atlanta based company conducted a series of focus groups to gain insight into flavor profiles that its loyal customer base was seeking for new crepe menu additions, and then utilized an outside culinary group to create chef inspired menu offerings. 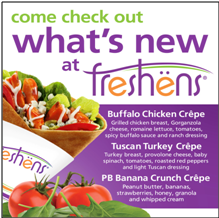 Freshens’ new savory crepes feature. Other savory crepe additions include Smokey Ham BLT and California Turkey. Each new savory crepe is less than 500 calories, made with fresh ingredients and is individually cooked for each guest. The newest addition to the dessert crepe lineup is the Peanut Butter Banana Crunch crepe. Made with fresh bananas, strawberries, peanut butter, granola, honey and topped with whipped cream. New menu items are rolling out to Freshens locations this spring. Along with the new menu, Freshens is implementing new procedures that significantly improve speed of service. 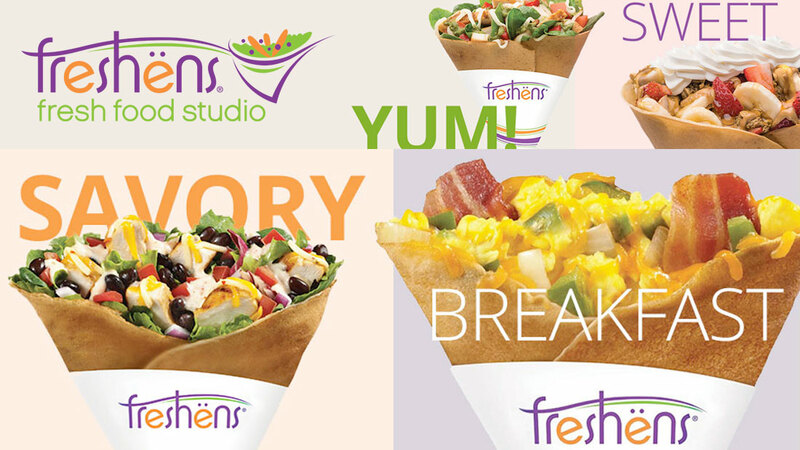 Freshens introduced its crepe and salad platform in 2011, which successfully positioned the brand as a leader in the healthy fast casual category. Freshens crepe, salad, smoothie and yogurt offerings give consumers healthy options that align with both snack and traditional meal occasions.